Idyllic rural setting on the outskirts of the charming village of Foxearth, just minutes from Long Melford and Sudbury. This sixteenth century Barn offers all the creature comforts in a relaxed, rustic setting. We can cater for up to 200 guests, Car parking facilities, fully centrally heated, Caterers’ kitchen, Bar, Granary for live music and Dance floor. 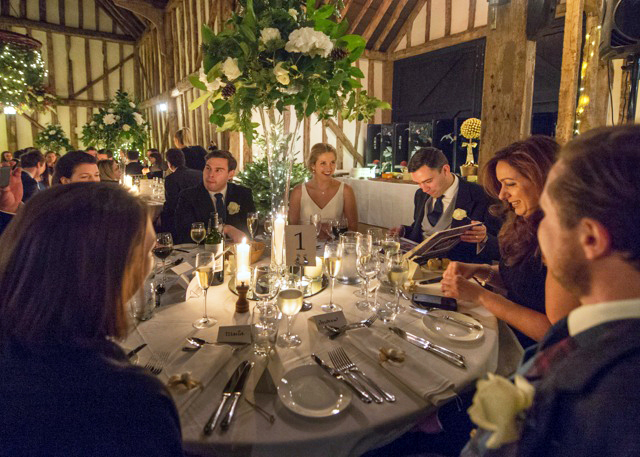 Contact Proprietor Pam Pluck to discuss all your requirements and view for yourselves the unique atmosphere of Foxearth Hall Barn for a Wedding or that special celebration. There are also future events being planned, the details of which will appear here periodically. discuss all your requirements and view for yourselves this lovingly restored Barn with its unique atmosphere for a Wedding or special celebration. Pam's professional 'can do' attitude, her many years in the hotel trade and her determination to excel are the very foundation on which she flourishes. Clearly, this very important day had to be right, and it was. Pam and her team provided a trouble free, stress free highly successful wedding celebration which drew praise and acclaim from all who attended. As for the venue, well the Barn is simply magical. A classic 16th century stunner it is wonderfully well appointed, with all you need for dining, bar and band. Put this together with the superb parking and you will have to go a long way to find better. Overall, we would do it all again in a flash..and not many say that about a wedding reception, do they? A wonderful barn, a 'top' proprietor and a day like no other. Exactly as it had to be. 5 stars! Foxearth Hall Barn is an absolutely beautiful wedding venue. It has everything you need to put on the party of a lifetime - a superb catering kitchen, an excellent bar area, the perfect stage for a band or DJ and of course, most importantly, a good dance floor! I can't recommend the barn highly enough. And to complement that, Pam couldn't be more helpful. From day one, Pam made everything easy and enjoyable and nothing was too much trouble. Her flexibility, positive attitude and years of experience in the trade made our wedding planning really fun and we couldn't have asked for anything more. Thank you Pam!